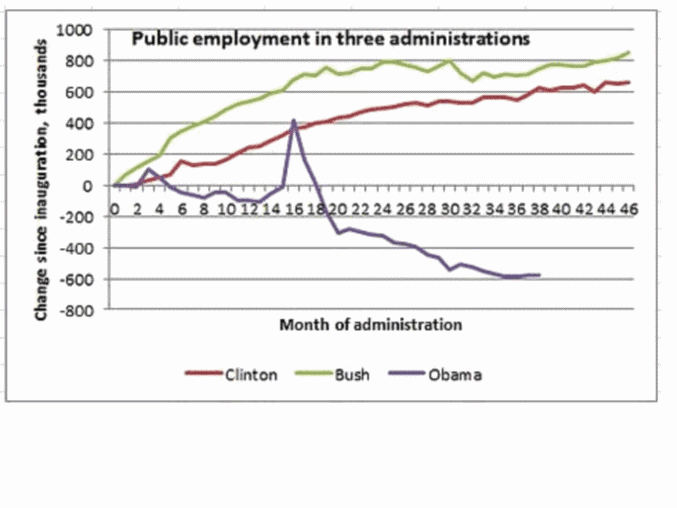 RALPHONOMICS: The U.S. public sector CUT employment during the recession!!!!! The U.S. public sector CUT employment during the recession!!!!! This is my chart of the week – copied from Warren Mosler’s site. The contents should be broadcast from the rooftops. I actually drew attention a few weeks ago to research indicating that U.S. states failed to spend stimulus money. But a picture or chart is worth a thousand words. Of course the chart is misleading in that a more realistic chart would have a horizontal axis representing zero public sector employees. Put another way, the coloured lines in the chart shown here should really be more or less horizontal. Nevertheless, the chart makes its point. The private sector cannot be blamed for cutting jobs in a recession: the private sector reacts to demand, and if demand declines, then the number of private sector jobs declines. That is unavoidable. In contrast, it is precisely the PUBLIC SECTOR that is in a position to maintain, or even expand employment in a recession. Excuses for not re-allocating surplus labour. Some parts of the public sector are similar to the private, in that they also depend on demand. But that is not a good excuse for failing to re-allocate labour within the public sector in a recession. Another possible excuse for the public sector failing to re-allocate labour in a recession is that the public sector is not as good at employing relatively unskilled labour as the private sector. While the people being re-allocated may well be skilled, the point is that the mere fact of their jobs becoming superfluous is an indication that there is an over-supply of their skills. Thus they are likely to have to work in a relatively unskilled capacity for a while. But if the public sector CAN’T re-allocate these people, then I don’t see much hope for a large scale WPA, or “make work” or “job guarantee” scheme (as advocates of Modern Monetary Theory call it), because that would involve vastly more relatively unskilled people doing public sector type work. The moral is that public sector managers need to be made to think up and have a list of peripheral or less important jobs or projects that need doing: jobs and projects that come into existence given a recession. And I’m not claiming the latter is an original idea: I seem to remember reading something about local governments in Sweden being made to have a list of peripheral jobs and projects that can be implemented, in a recession. The phrase “jobs and projects” might sound like a tautology. However jobs can be increased without increasing the number of projects: by employing more people on existing projects. Those existing projects would not necessarily be finished more quickly – the additional labour could enable value to be added to the final output of those projects. A large portion of the decline in public employment is likely from state and local levels, which cannot as easily act in a counter-cyclical manner. 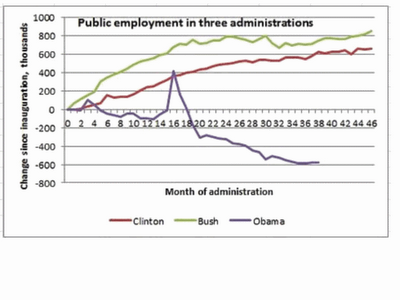 Clearly during the Clinton and Bush administrations, public employment was rising regardless of the economy. I don't disagree that it's "the PUBLIC SECTOR that is in a position to maintain, or even expand employment in a recession." However, if the public sector does not contract during growth periods, this implies an ever increasing level of public sector employment. The question is, how do we focus on making the public sector more counter-cyclical rather than solely worrying about the downside? Keynes was a racist – shock horror. Steve Keen’s debt jubilee idea. Prof. Raghuram Rajan is clueless. Hogwash from the Bank of England on QE. Prof. Mariana Mazzucato makes amazing discovery. The difference between MMT and Keynes. Some money is BOTH base AND broad. Banks are inherently fraudulent institutions. Banks aren’t lending to SMEs – boo hoo.